I’m fortunate that I can buy my veal from a nearby dairy farm, Sweet & Salty Farm in Little Compton, RI, where the animals are grass-fed and raised humanely. That makes for happier animals and incredibly flavorful meat…and no guilt about using it. I also buy veal bones from Sweet & Salty Farm, roasting them on a sheet pan in a 400-degree oven for 30 minutes, then placing them in a large pot of water. I take some chopped carrots, onions, and celery, toss them in a little olive oil, and place them on a sheet pan, roasting them in the oven until they’ve caramelized, then add them to the pot with the veal bones. The secret to a great veal bone broth is to boil the bones and veggies for as long a time as possible. Restaurants will do this for days, replacing the water in the pot as needed. At home, I’ll start the broth in the morning and finish it by evening. The subtle flavor of veal can get lost with heavy seasonings, so I keep it simple. The addition of veal bone broth amplifies the flavor and keeps the meatballs from drying out. Make the meatballs: In a bowl, combine the veal, breadcrumbs, parsley, oregano, basil, salt, pepper, garlic, onion and egg, mixing the ingredients thoroughly. Don’t over-mix. 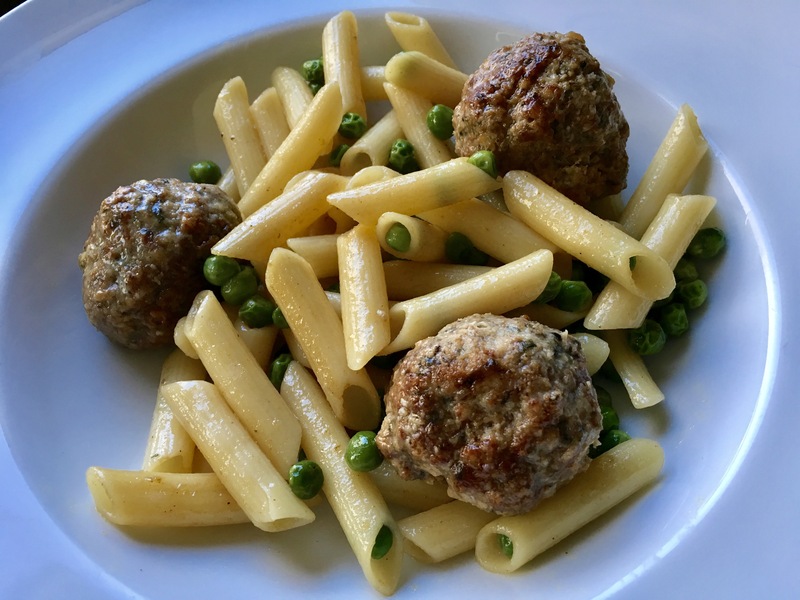 Heat a tablespoon of the olive oil in an oven-proof pan, and form the meatballs one by one, placing them in the pan. Brown the meatballs on all sides over medium heat. Place the pan in the oven to cook the meatballs for 10 more minutes. In a saucepan, heat the veal bone broth or beef broth. Once the meatballs have cooked in the oven, transfer them to the pot of broth and cover it with a lid, keeping the heat on low. If the broth doesn’t cover the meatballs, turn them every once in a while to keep them moist on all sides. Cook the meatballs in the broth for about 30 minutes, then transfer them to a large sauté pan. Turn the saucepan with the veal broth on high and reduce it to about 1/2 cup. Season it with salt and pepper. In a large pot, cook the pasta to a bit firmer than al dente in well-salted water. Drain it and set it aside. In the large sauce pan with the meatballs, add the butter and the half-and-half. Add the reduced veal broth, the pasta, and the peas. Gently mix the ingredients in the pan until the peas have warmed through and the sauce clings to the pasta. Serve immediately. Successful gardening is a combination of art, science and luck. You can do everything by the book, and one season, Mother Nature will reward you with a bountiful harvest. The next season, when you think you’ve got it all figured out, she’ll give you nothing more than a cluster of dead plants. That’s why, if there’s such a thing as a foolproof plant, I grow it. Perennials are the perfect example: you plant them once, and they come back year after year, with little or no work, sometimes bigger and stronger with every season. In the vegetable garden, asparagus is one of those delicious, reliable crops that comes back every year. Onions, chives and some herbs are favorites as well. But in the late 60’s, the Sugar Snap pea was introduced. It became an AAS winner in 1979, and later was awarded the most popular vegetable of all time! What made it different from standard peas was that you could eat the entire pod: the peas and the outside shell. They were sweet, they were prolific, and incredibly easy to grow. 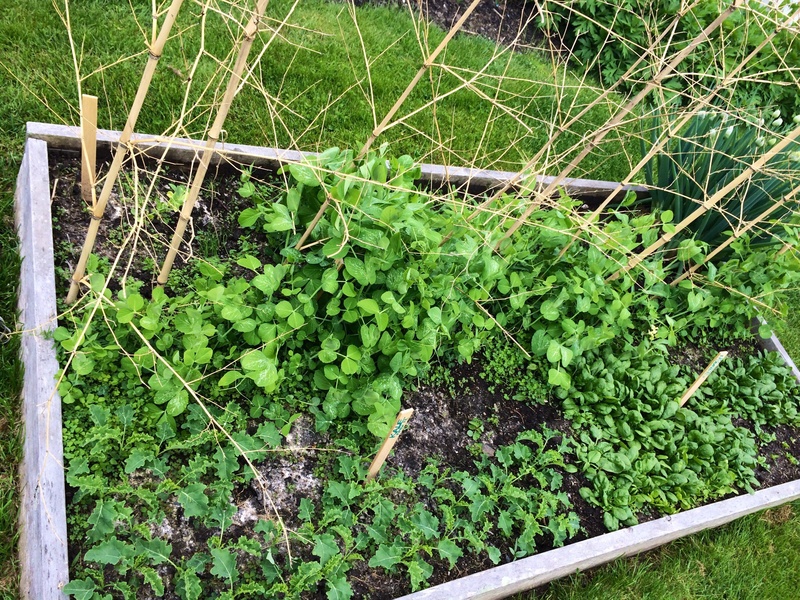 Once I discovered Sugar Snaps, I grew no other pea. 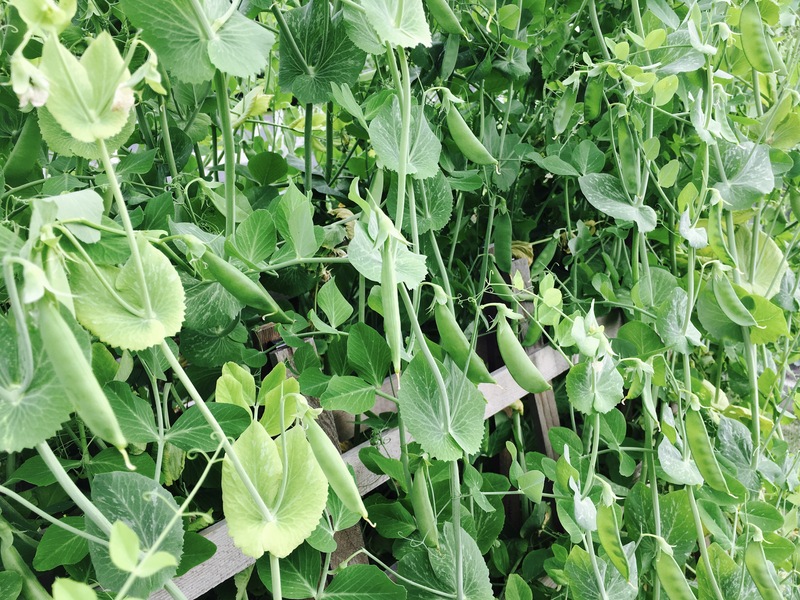 If you let Sugar Snap pea pods grow to their fullest, you’ll get a nice, plump crunchy pod with sweet, juicy peas on the inside. There’s no need to cook these peas…they’re at their most flavorful when eaten raw, straight off the vine. 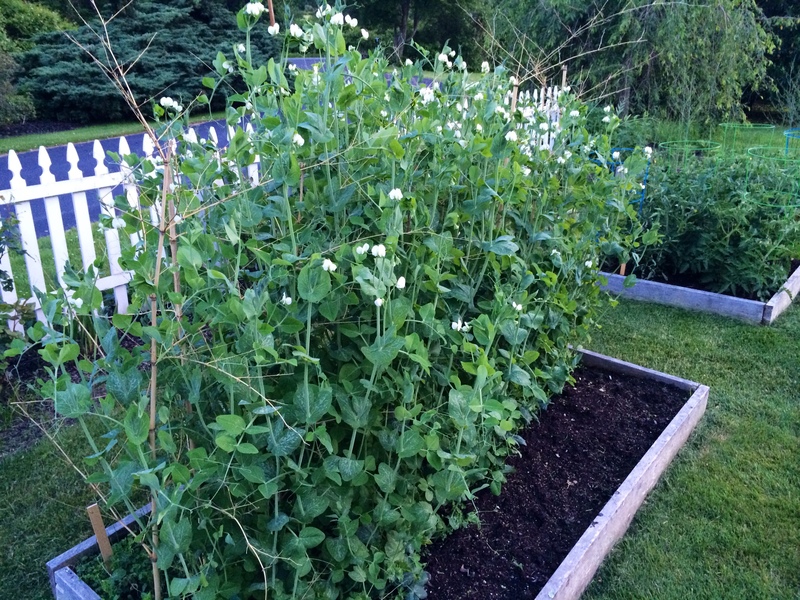 Sugar Snap peas in early June: well over 6′ tall! 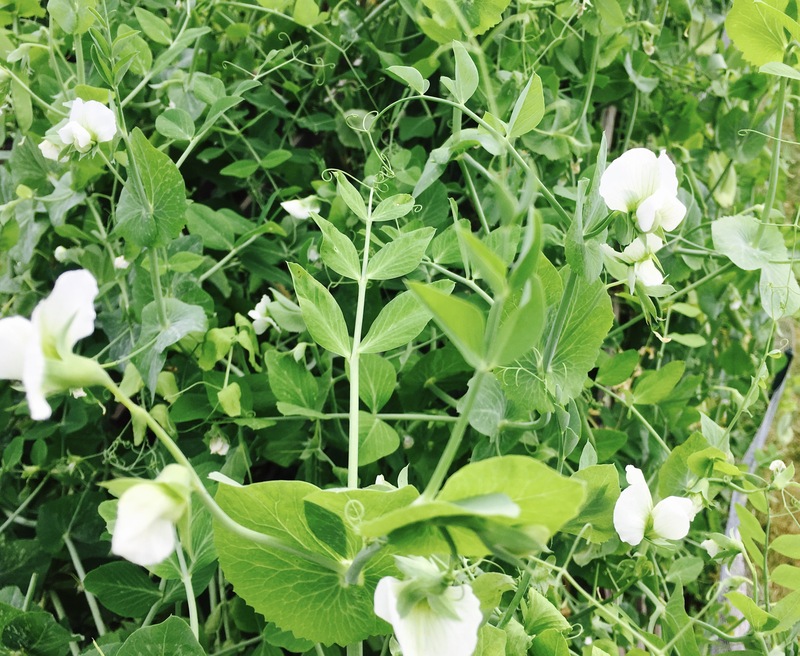 But what makes Sugar Snaps foolproof is that you can eat them at any point during the growing season. Pick them early, when they’re flat and small, and use them in a stir fry. Wait until they plump up, and they make a refreshing crunchy treat. And when the season ends, when your pea plants start to wither in the summer sun and it’s time to pull the plants out of the ground and toss them in the compost pile, you can still pick off every single tiny pod left on the plants for that last farewell snack. They say you can grow peas in the fall, but I’ve had limited success. 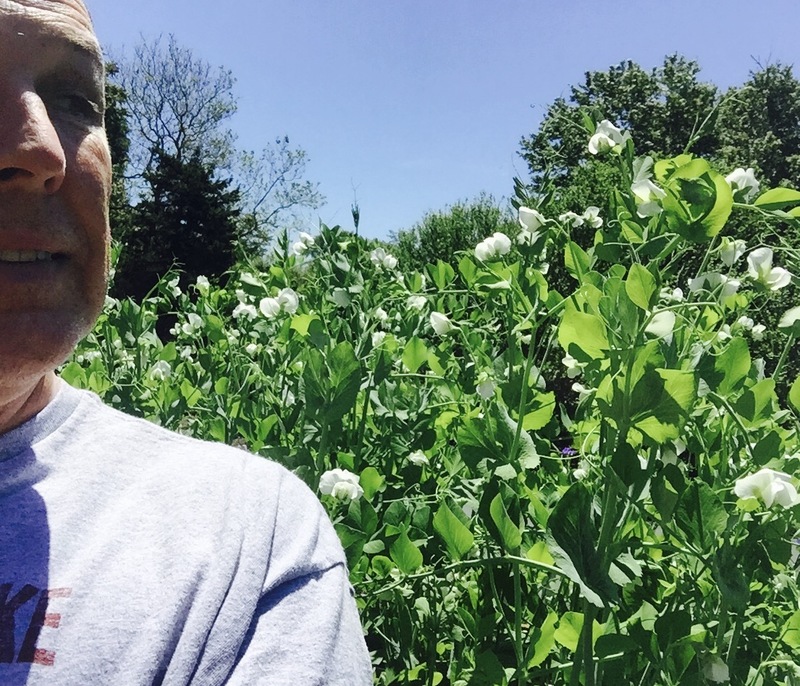 There’s something magical about growing peas in the spring. They’re one of the first plants to grow, when the weather is still cold and damp, tiny green shoots sprouting out of the cold (sometimes snow-covered) soil…a sign of better, warmer, sweeter days to come. I’m fortunate that I can buy my veal from a nearby farm where the animals are raised humanely. That makes for happier animals and incredibly flavorful meat…and no guilt about using it. The subtle flavor of veal can get lost with heavy seasonings, so I keep it simple. The addition of veal bone broth amplifies the umami factor and keeps the meatballs from drying out. Make the meatballs: Combine the veal, breadcrumbs, parsley, oregano, basil, salt, pepper, garlic, onion and egg in a bowl, mixing the ingredients thoroughly. Don’t over-mix. In a saucepan, heat the veal bone broth. Once the meatballs have cooked in the oven, transfer them to the pot of veal bone broth and cover with a lid, keeping the heat on low. If the broth doesn’t cover the meatballs, turn them every once in a while to keep them moist on all sides. Cook the meatballs in the broth for about 30 minutes, then transfer them to a large sauté pan. In a large pot, cook the pasta to a bit firmer than al dente in well-salted water. Drain and set aside. As I mentioned a little while ago, I grow two varieties of bamboo in my yard, and although they are quite invasive, I have my own methods of keeping the plants in check. One stand of bamboo is in a corner of my yard that is overrun by brambles and other nasty vines. So I have no issues with the bamboo taking over this area at all. I’d rather have a desirable invasive than an ugly one. The other stand of bamboo is a larger variety that grows to 25 feet tall, and it requires more maintenance to keep it in the area I want it to stay in. So, when some of the shoots get in my way, I simply cut them with a hacksaw and use them in my garden. I use them as tomato stakes, supports for my cucumbers vines, and even pea brush, as shown here. For pea brush, I don’t remove the smaller side branches, which gives something for the peas to attach to. The photo above was from earlier in the season. Here’s what it looks like now: over 6 feet tall! Peas with pea brush, kale, spinach. The kale and spinach have been harvested. (The weather’s too hot for them now.) And I’ve sown some lettuce mixes in their place. 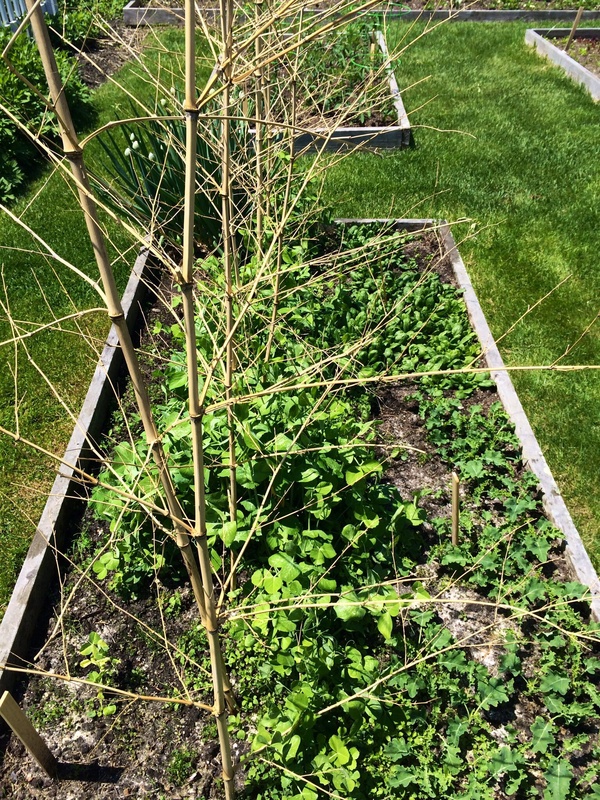 Since the bed of lettuce is on the north side of the peas, the lettuce will be shaded by the peas in the hot sun. Bamboo is a great way to give my garden a more natural look, and not having rusty metal poles everywhere. I grow two varieties of bamboo in my yard, and although they are quite invasive, I have my own methods of keeping the plants in check. I use them as tomato stakes, supports for my cucumbers vines, and even pea brush, as shown here. For pea brush, I don’t remove the smaller side branches, which gives something for the peas to attach to. A great way to give my garden a more natural look, rather than having rusty metal poles everywhere. 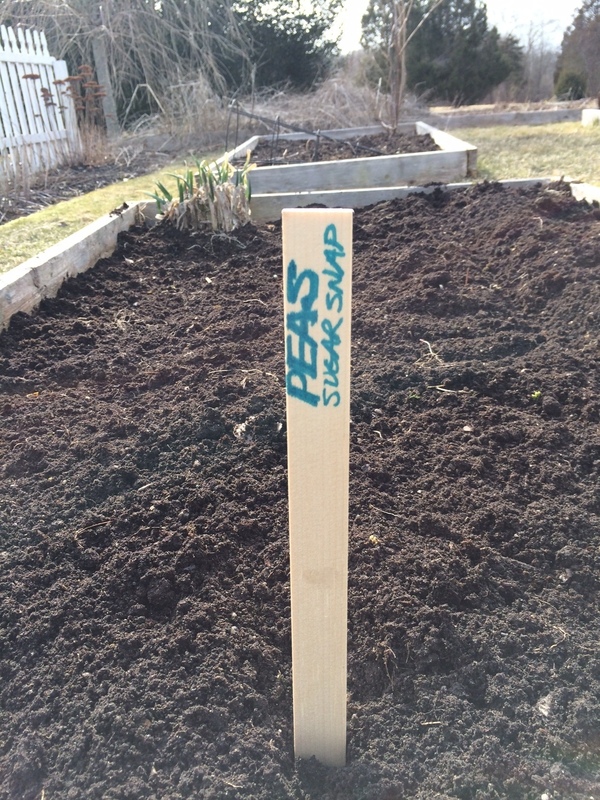 PLANT YOUR PEAS ON ST. PATRICK’S DAY! That’s how the saying goes here in New England. 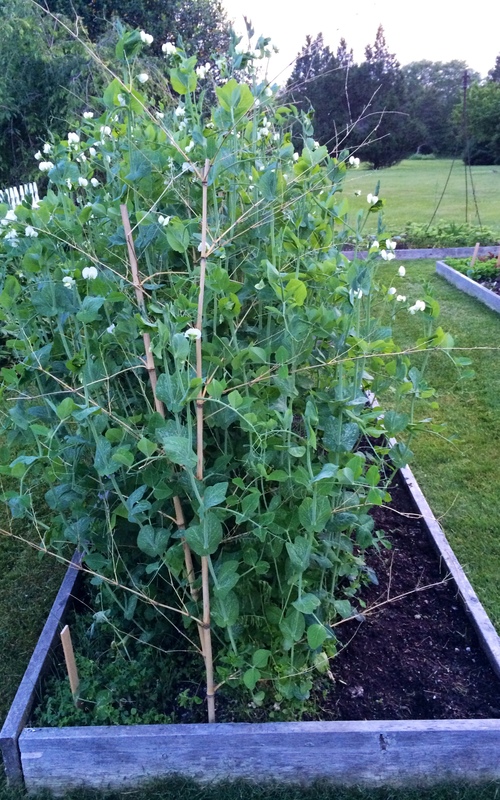 I’ve sown my peas in my garden as soon as the soil can be worked in the spring for years with great success. In addition to peas, you can sow arugula, broccoli raab, radishes and onions. Sprouting the peas indoors before sowing by placing them on a moist paper towel for a days or two can speed the process, but I usually just sow them directly. 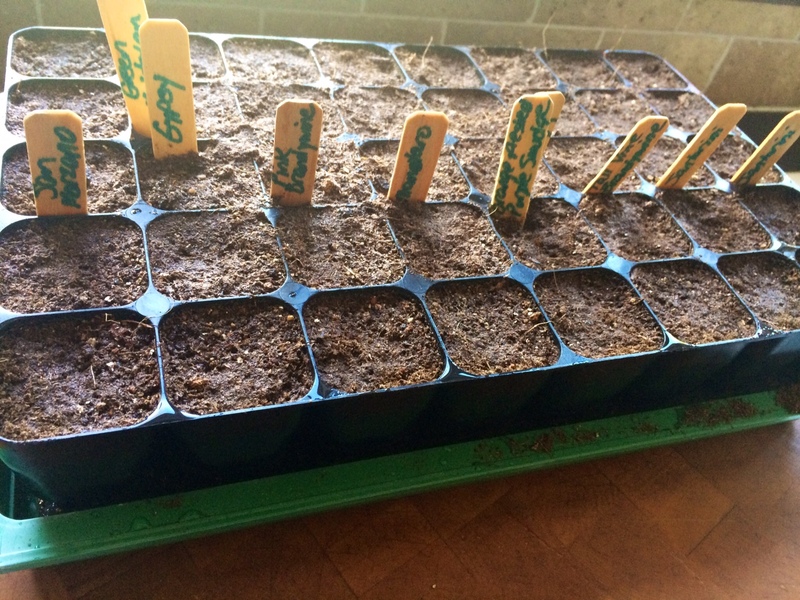 I also start some seedlings early indoors, including tomatoes. These will go under grow lights for several weeks until the weather outside is warm enough for them to be transferred to my unheated greenhouse.